People usually have a strong demand for converting DVD to MPEG on Mac. MPEG gives you access to an array of devices while DVD is only playable when there is a DVD player and disc drive. Meanwhile, the major advantage of MPEG compared to other video and audio coding formats is that MPEG retains very good quality while reducing the size of the DVD after the conversion since it has a high level of compression. The DVD to MPEG conversion is especially helpful when your hard disk space is insufficient to store all your original DVD movies. But is it easy to convert DVD into MPEG? Frankly, things might be tough if you don't have a proper DVD to MPEG converter, especially when you are dealing with the copy protected DVDs. For example, the DVD ripper could nnot continue and failed to read file or gave you a "reading/writing error control" message, and so on. Hold on, the post will share a feasible tool to deal with the conversion from DVD to MPEG format without any error. MacX DVD Ripper Pro is proven to be the powerful DVD converter. With unique DVD analysis mechanism, it can easily read the titles of any protected DVDs without any third-party software and rip any encrypted DVDs to the format you like,regardless of the DVD copy protections like CSS protection, Sony ArccOS, CSS region protection, UOPs, APS, etc. You are also allowed to finish the DVD to MPEG conversion with extremely high quality and fast speed. A test shows that it converted a regular 2-hour DVD movie to MPEG format within no more than 10 minutes on a desktop PC Acer Aspire, intel core i7- 6700 CPU@3.41Ghz with 16Gb of ram on windows 10. Of course, the fast speed is also appied for Mac computer, and even better. Meanwhile, the awesome DVD to MPEG ripper also supports to copy protected DVD to ISO, MPEG2, and MKV with full/selective titles, tracks and subtitles. Now let's go ahead to the steps to convert DVD into MPEG, it's really simple. 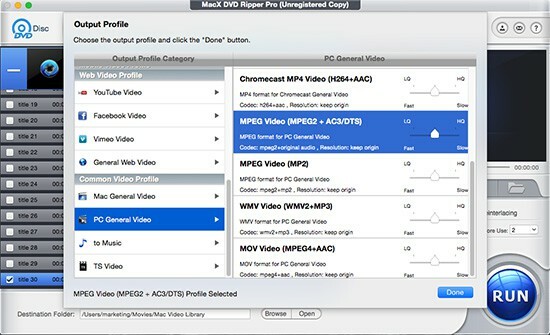 Firstly, free download DVD video to MPEG Converter on Mac and install it. By the way, you can also free download Windows version to finish the conversion on your PC computer. Step 1 Load DVD Movies or DVD Folder. Click DVD Disc to add your new movies on DVD from DVD drive. Or you can click DVD path to import DVD from DVD folder saved on your computer. The loaded DVD information like title will be scanned within a few seconds. Step 2 Choose Output Video Format. After DVD imported, go to Common Video Profile > PC General video > choose "MPEG Video" as the output format. Step 3 Select Output Folder. Specify an output folder on your Mac or Windows to save the output files. Click "Browse" button to choose the path where you want to save the output files in. "RUN" button to start convert DVD to MPEG format. You can view the conversion progress and are able to cancel the converting process at anytime. MacX DVD Ripper Pro is the fastest DVD ripping solution which features to convert DVD to MP4, H.264, HEVC, MOV, FLV, MPEG, M4V, AVI, QT, and any other formats. It makes you easily watch any DVD on Mac, iPad, iPhone, iPod, Apple TV, QuickTime Player, Android, PSP, etc without third party assistance. Disclaimer: We only advocates copying and ripping DVDs under the concept of Fair Use and does not encourage any illegal reproduction or distribution of copyrighted content. Please abide by the local DVD copyright law before doing it. Feel anxious to convert AVI videos to MPEG format on Mac for playback on MPEG-supported devices? Take it easy. This article shares you the best AVI to MPEG converter freeware and helps you convert AVI to MPEG on Mac easily in a few minutes. This guide introduces an easy method to convert any protected DVD to MOV format so that you can play on Mac's default player QuickTime, iPhone, iPad, Apple TV or edit in iMovie with ease.